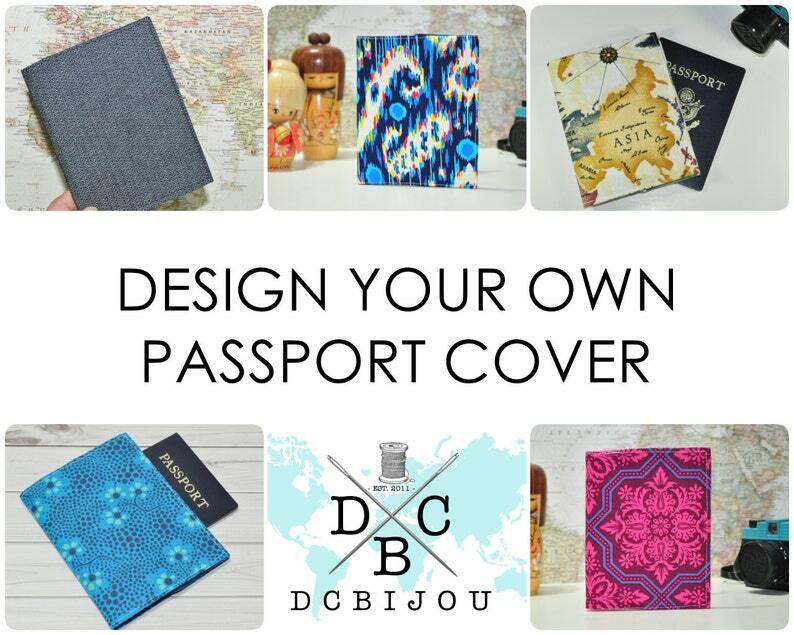 Design your very own passport cover from a variety of fabric prints and colorways! These fabric passport covers are lightweight and stylish - select different prints for yourself, friends, and family members for your next overseas adventure! Passport covers protect your passports from getting tattered while you travel, and the bright prints allow you to easily locate passports in your bag without looking obvious to others. Use it like a jacket and slide the front/back covers into either pocket, or keep your passport on one side with your boarding pass/tickets folded in the other pocket. These covers will also work well to protect passport-size (like Field Notes or Midori Traveler's) notebooks whether you're writing notes during your travels or jotting down ideas at a local cafe. ✔ 100% premium cotton fabrics, treated with interfacing for structure and stability, and a coating of Scotchgard for protection against spills and stains. ✔ Fits standard passports (US, UK, Canada, Australia, etc.). ✔ Two pockets - slip passport in one and keep receipts/travel papers in the other pocket, or use it just for your passport. ✔ Measures approximately 5.50 inches tall and 3.75 inches wide (14.00 x 9.50 cm) when closed. - Select the Outer Print from the drop-down menu to the right; available options can be viewed in photos 2-4. - Select a Solid Lining Color from the drop-down menu to the right; options can be viewed in the last photo.